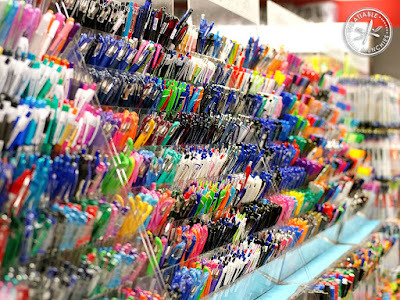 Stationery Aisle - Future rubbish. I've just been to a meeting. And because I take notes and there were more people like me in it I have noticed how many of us are using disposable pens, markers, felt-tips and other items which will become the rubbish of the future soon. And that got me thinking about the shopping lists we do. At my home, we have a couple of pens and a few markers to make quick notes when mobile is not around. That is lazy I admit, but how many of us don't even stop to think about it. Pens are quite tricky to recycle. They are often created from several different types of materials, which would need manual labour to be dismantled and then some of those, I'm sure, are not recyclable. Also, refills and inks used in ordinary pens often contain harsh substances and pollutants quite harmful to the environment. So I looked around, and it seems that apart from electronic methods of taking notes, which I'll cover later, the best sustainable way is to use pencils with fountain pens in the second place. First are biodegradable, and second are reusable. Of course, you'd use paper (biodegradable), which on the other hand I hate wasting. At this point, we all have mobiles, and almost everyone has a memo-type application of choice. I'm an Android person so mine is the built-in Google keep app. You can create lists, notes, reminders and share them with people who have Google account. I'm sure Apple has something similar. To switch to using an app as opposed to writing is probably easy for younger generations, but some of us will need a transition phase and it will take some effort to switch completely. There is, of course, the thing with being reliant on gear which needs to be powered up to work. But I think it's worth switching for the majority of things, and keep pencils (I'm going to grab some of the colourful ones just for fun) for when you absolutely can't rely on tech. When opting for pencil make sure you chose only safe ones. Although the centre is called lead it has no lead component, that is a mistake from ancient times (you may read about it in Wikipedia). However, there are components which are still used and are either carcinogenic or unsafe. It is best to go for a graphite or charcoal pencil (black lead). When buying coloured ones be extra careful, because they can contain toxic stuff and be covered in toxic varnish. I find pencils for children to be generally safer but I still check. Many companies sell eco-friendly art materials for children, and I think these are the best. Messy and a bit old fashioned? Can be, but then they are very classy and ECO. 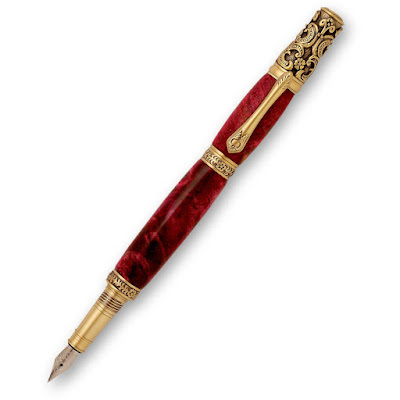 You can easily buy completely natural and non-toxic ink and even pens are sometimes made from wood and metal, no plastic whatsoever. Some of them are a real work of art too. 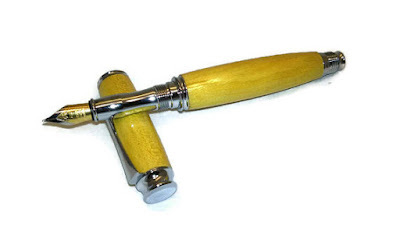 Wooden Fountain Pen Handmade from Yellowheart wood.